I love (to laugh at) my children. 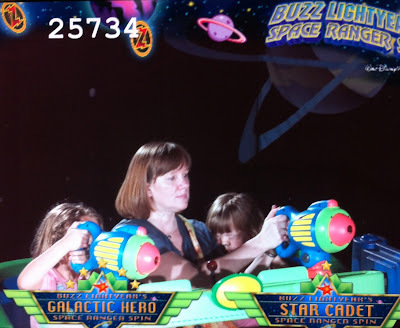 Me: Hey... did you like the Buzz Lightyear ride? 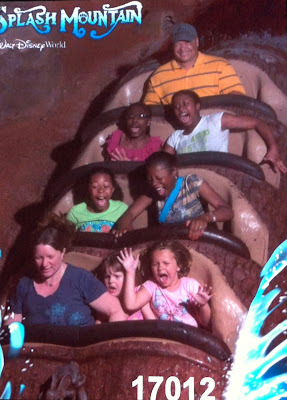 Me: Hey... did you like Splash Mountain? I can't help it. I look at these 2 pictures and can't help laughing at Ana and Zoe (and at everyone else). I just love ride photos. Does it make me a bad mom because I look at these and can't wait to take them both on more rides just so I can see these kinds of pics? That would be torturing them right? Just for the record... the girls did like a few rides. Zoe's FAVORITE ride at Disney this time was Aladdin's Magic Carpet Ride (and everything else). Ana's FAVORITE "ride" was the Country Bear Jamboree (and nothing else).